People all day have been describing their role in today’s inaugural events–whether they’re spectating live or watching remotely–as “making history.” I felt some of that myself, and that played a role in the fact that I let a(n early American history) class out 5 minutes early so they could see our new president take the Oath of Office live. Still, the impact of people’s participation in something as momentous today makes me really wish we saw our day-to-day lives as historical artifacts. I’ve been thinking about the many knitted heirlooms people brought in to Knit Purl in to be admired, repaired, copied and reknit. These physical remnants of the things we do every day–the things we take for granted and which others often mock as frivolous–are proof that the mundane is just as much a part of the history we make for ourselves as grand events like this inaugural celebration we’re all watching intently. And that’s what’s got me really thinking. Today is important, sure, but how can we take rhetoric that makes us feel good and turn it into reality. The only answer I can think of is this: We can’t just make history on big days like today. We have to make history, with intent and vigor, on days like yesterday and tomorrow, with the little tasks we have at hand individually. We have to treat each component of our lives as a little piece of history or we may again lose sight of how much each of us individually contributes to the world around us and to the successful completion of the big tasks that face us as a nation and a planet. There is something profoundly weird about the life academic. The strange juxtaposition of grade-or-die work binges slammed up against equally intense periods of absolutely nothing can be a little jarring, even though that parabolic cycle of rest and ruin fits my own preference for a very strict, careful division between work and play. I have, if you will, my own little personal firmament* that divides work from play, semester from break. This winter break, the division between work and play wasn’t accompanied by a plane ride anywhere. Instead, the play** of break wrapped itself around the same geographic surroundings that had marked the real work of the semester. Finding a way to reconcile the change in behavioral patterns without a concomitant change in environment was a little isolating and required quite a bit of readjustment. Ultimately, the new non-geographic way of dividing work from play rendered up any number of worthwhile things, some corporeal and tangible, others slightly less so. The socks (and a hat/scarf set that is still to come) were accompanied by intangible rewards: personal validation, though that too had a corporeal form in the shape of evaluations from students. Good ones. Really good ones. So good that I’m almost afraid to talk about them any more, lest I jinx myself for this term…. 2008 was a very serious test, in many many ways. The early part of last year’s academic summer break, and the accompanying early-summer break-up, tested my will to pursue a life undertaken with great care and intent, and that meant serious consideration for what’s most important in that life. Fall semester brought with it not just another division between work and play, but a growing division between gloomy past and promising future. Friends and family (hey, that’s you!) have provided support in spades, but it still came down to whether or not I could harness all of the help and good will flowing in and channel it effectively in the unexpected process of reshaping my life. As a result, the fall semester was one long pep-talk. I kept reminding myself over and over again that the measuring tape that matters most is the one in my own head, not the one that someone else handed to me. The ongoing emphasis on internal validation coupled with the strange, isolating, unfamiliar shape of this winter break meant I had lots of time to think. That’s been good, but it also had me feeling a little bit like I was tuned to a different frequency than everyone else. The stack of very important papers sitting next to me, heavy with the penciled-in scribblings of students, proves that occasionally, regardless of how sure you are of what you want, what matters is some sort of sign from the outside world that you and it are orbiting the sun at basically the same rate. *You know, the firmament? From Genesis? It divides the waters below from the waters above. And God called the firmament heaven? Nevermind…. **”Play“! Hah! Take that, Derridaean critical theorists! It has been so long since I did anything other than Judy’s Magic Cast-On that I actually goofed in a serious and vital way when I went to cast on for a scarf tonight. Guess I need to go to remedial knitting school. Think there are night classes for that sort of thing? Hope you all had a lovely winter holiday (of whatever persuasion) and are prepped for an equally lovely entreé into the 2009 New Year. Pictures of the holiday fog and the new scarf tomorrow. I promise. I love my camera. My Canon SD1000 is a tiny thing of limitless wonder, and I have spent the last year finding ways to use the Canon camera hack to make my life as a graduate student better after reading a post about it on Lifehacker. To wit: A 10″x13″ piece of half-inch thick plexiglas and a bendy tripod coupled with the camera hack that takes automated interval shots gets me an upside-down scanner that can shoot high-quality OCR-able scans of a 250 page book in under 20 minutes. Voilà, an electronic book in PDF format that I can use with Skim to double my reading speed and still take good notes. Truly a life saver when I have a big chunk of reading to do. But the qualities that make my little point-and-shoot darling a fantastic scanner sometimes get in the way of real photography. Unless you’re made of stone, the camera sometimes doesn’t focus properly, and trying to get a nice photo that’s well lit under any circumstances is a near-impossibility. Even with a decent flash and good ISO control, no photo taken in normal lighting will ever be a great photo because the optics aren’t the best. The subject? A new hapagirl.com pattern, a baby set that’s been turned on its head. 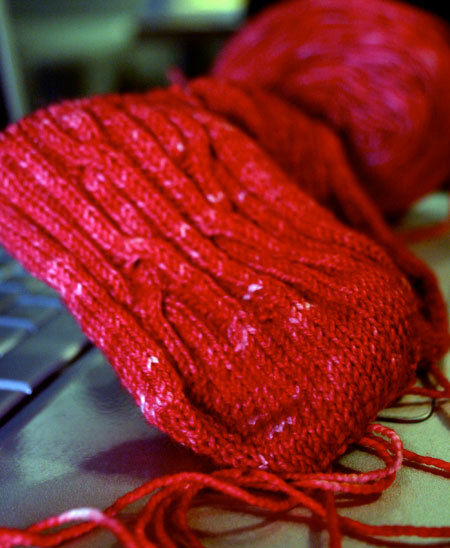 The knitting, testing and pattern editing are nearly complete, and it should be out tomorrow. Today. At some point in the next 24 hours. Whatever…. Clearly I need to re-regularize my sleep schedule. Twisted. Kinked. Matted. Torturous. Snarled. Chaotic. The sock blank is a truly wondrous thing; its swift changes of color heed not the worrisome siren call of the Fraternal Twin Sock Syndrome, creating a thing of beauty that is, in fact, paralleled by the other thing of beauty right next to it. And knitting two socks at the same time, toe-up, is equally awesome (in the original sense of the word, “something fantastic that inspires awe,” rather than in the Bill-And-Ted’s-Excellent-Adventure sense of the word, “something random that makes Keanu Reeves say, ‘Whoa!’”). The two things together? Apparently, two rights make a wrong. A very big one. Things were humming along swimmingly until I hit the heel turn and started to use yarn from one strand at a different rate than yarn from the other. I’m halfway through the heel turn on one sock and have had to slip stitches across to the other heel to work on it just to bring the second, long, unwieldy, difficult, wearisome, obstreperous strand into the world of seemly, appropriate yarn behavior. As usual, life and art imitate each other, so the week, too, has been twisted, torturous, snarled, chaotic, wearisome and obstreperous. As a reminder that my wounded knitting and wounded week will eventually work themselves out, however, I have full use of my faculties. And my thesaurus. I spend most of my days–all but a very few a year–on a gerbil wheel, walking the same 20-block route to and from the markers that divide day from night, work from home, classroom duties from research duties. Friday’s trip took me off of the gerbil wheel and on an almost overwhelmingly sentimental trip to one of the biggest landmarks in a geek’s life: Frys. There were, admittedly, a few non-geek things thrown in for good measure, including a very satisfying trip to an Ann Taylor store that resulted in one of the most coveted shopping experiences a well-endowed woman can have (a good-quality perfectly fitted white button-down shirt in the right size, on sale for less than $20). Still, the indisputable stars of the day were the fumes of computery goodness in that most precious of geek meccas. On those rare instances when I do set foot off of the gerbil wheel, it’s always a little strange, a little limiting, to come back to it, especially when a trip to Frys feels just a little bit like a homecoming. It’s times like this when I appreciate more than ever one of the projects I undertook at the beginning of the year: a pictorial of change to remind me that my gerbil wheel is as much a thing of beauty as the unchanging haven of silicon that is Frys. These three photos are all from October of this year, taken from my living-room window, spaced evenly 2 weeks apart. It’s amazing how much can change in the space of a month. Equally amazing is the lack of knitting that has gone on in the last week, but that is a post best saved for tomorrow. Or, potentially, both, which is even better! The pesto is colorful, and it’s in single-serving ice-cube format. How cute! The knitting has come down to socks, socks, socks and more socks. The socks are even more colorful! They’re very pretty and one of them is even the product of my own hand-dye. I’m probably going to rip back the hand-dyed version, though, because I want to put together another pattern with the forked heel in several different sizes. The issue at hand is how to do the ribbing so that the sock pattern itself is a worthwhile contribution to any sock knitter’s repertoire, rather than merely a vehicle for the forked heel. Chemgrrl suggested a column of 3×1 interspersed with 3 columns of 1×1. What do you think?